Calls for greater accountability by boards in both the non profit and for profit sectors has intensified in recent times, due primarily to the findings of the most recent Royal Commissions and other enquiries. One is left to wonder if we would have experienced the type of poor behaviour and resultant tragic outcomes that have been highlighted by these enquiries, if greater degrees of accountability had been accepted and implemented by the boards charged with the governance of organisations in these sectors. This month, we will highlight the different facets of accountability and present some initiatives that can be implemented to fulfil your board responsibility to accountability. The complexity of these relationships and the degree of accountability is dependent upon a number of factors including, the industry in which the business is operating, the size of the organisation which in turn relates to revenue streams (number and size) and the corresponding number of staff and clients. There are no set formulae for how an organisation determines the level of accountability to each stakeholder that is dependent upon individual assessment and agreement; however what is not an option is that any are ignored. Finances: whilst not the sole determinant of long term success, the financial perspective is still fundamental to this goal and one that boards are undoubtedly responsible for; this accountability includes disclosure, transparency and creating a business model that meets both short and long term financial and organisational obligations, whilst delivering the required outcomes. Governance: the board is the nexus of care, culture and values. Board members are responsible for seeking and considering adequate information to make the best decision for the organisation it governs whilst always acting in good faith and the highest standards of ethical behaviour. Peer review – is performance consistent with the mission and values of the organisation at all levels – the board, management and staff? The “how “of accountability can be the minimum to meet required outcomes or the best it can be to meet self-determined standards – the choice is yours. 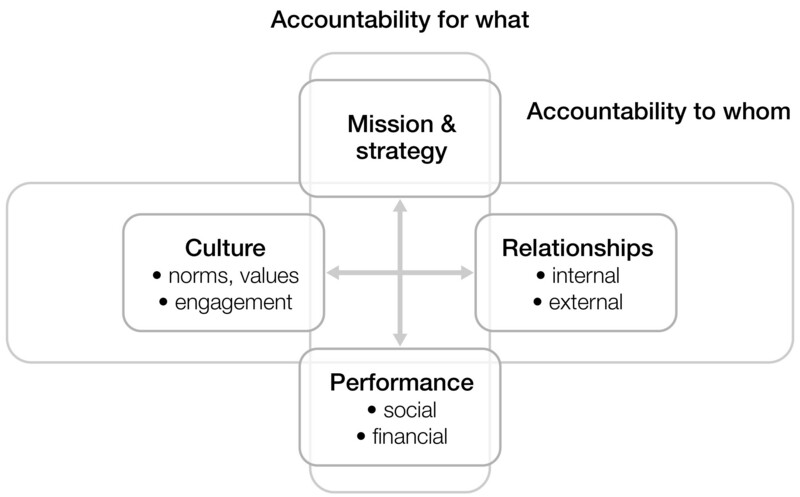 The general conclusion is that accountability is not simply about compliance with laws or industry standards but is, more deeply, connected to your organisation’s purpose and stakeholder trust. Leaders therefore should pay greater attention to strategy driven forms of accountability that can assist their organisations achieve their mission and long term goals. Furthermore, choices have to be made, for a non-profit cannot be accountable to everyone for everything. As such, non-profit leaders need to focus their attention on accountabilities that really matter, not just tick the box. Join our Private Network - it's FREE!